Rebuilding a 1925 t engine. 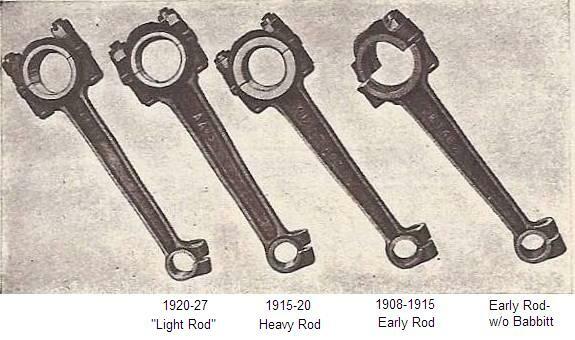 I'm noticing that the four connecting rods are all different sizes. 3/4"-1", 13/16"-1 1/4", 5/8"-15/16" and 5/8"-3/4". all the rods have the ford script on them. my question is did ford make this many different rod sizes or did someone periodically replace a rod at different times? Although the engine seamed to have run smoothly when I bought the car....what problems might I see down the road if they aren't the same size rods? Or doesn't it matter. Please keep in mind I am not making a 1000point car here but,a mechanically sound one. Running Fine Compared to what. Herm - I guess that running fine means that it ran, which is 75% of the way to perfection. This opens a bunch of questions about rods, pistons and counterweights on cranks. If someone has a 15-20 crank and uses aluminum pistons with light rods do they need to remove some of the counterweight? How about just changing the pistons to aluminum and using the heavy rods with a 15-20 crank? Or changing to aluminum pistons with a 20-27 crank? Enquiring minds what to know - the rest of us ask questions so everyone gets confused! Jim, that link is a little confusing! rods?, no, foot peddles, yes! I think that the T engine is one of the most forgiving engines I've come across in 45 years of twisting spanners for miss matched combination of parts and still run for many years in between rebuilds. An other model T of course!!! 20-27 rods are the most common. If you are rebuilding the engine every thing you can do to reduce reciprocating weight and equalize it between cylinders is worth doing. There is a huge, and wonderful, difference between an unbalanced engine with cast iron pistons and a balanced engine with aluminum pistons and light rods. When my engine was rebuilt, one of the light rods I supplied was said to be too twisted to straighten, so the shop used a heavy rod they had lying around. It will shake the fillings out of your teeth if you try to run anywhere near full throttle, so it's going to have to come apart again. While you have the chance, balance everything you can IMHO. The connecting rod sets sold by the major vendors are matched by weight... All the rods weigh roughly the same, HOWEVER, the balance of the rods are usually all over the place... So much that many times it is impossible to balance them. I have had rod sets that all the rods were within 10 grams, but the variance in weight between the heaviest and lightest rod at the wrist pin end was 21 grams! An easy rule of thumb for visualizing weight when doing balancing work is that a nickel weighs about 5 grams, and the amount of metal contained in a nickel is equivalent to the amount you have to remove to lighten something by 5 grams... Now, stack up 4 nickels... There is no way you can take anywhere near that amount off the small end of a connecting rod! New rods are sold as "matched by weight" and they are sometimes pretty close, but they are FAR FROM BEING BALANCED! 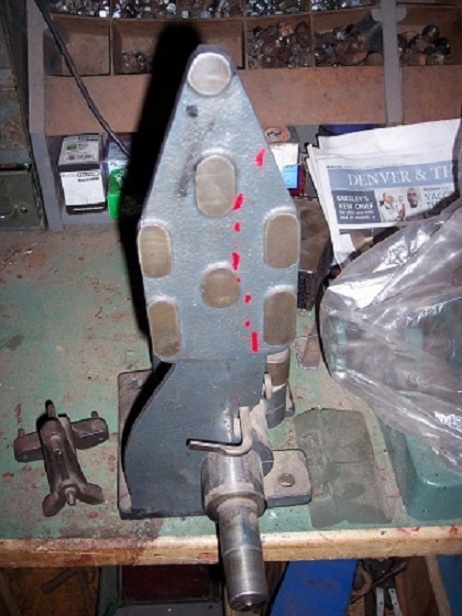 I blueprint my rod cores and roughly sort them by weight before & after I babbitt them. They get babbitted with fresh alloy that has not been previously melted and contains no scraps or cuttings (I sell my scraps & cuttings to guys that restore farm implements). The babbitt gets CNC machined to my specified diameter and correct radius and width according to the FORD print. I've been using my own rods in all the engines I've built in the last couple years and have had great success. They work out to be about twice as expensive as the ones available from the major dealers, but I save enough time during installation that they end up being about the same price when I'm building a fully balanced & blueprinted engine for someone. Other than part of a complete balanced blueprinted engine, I do not currently sell the connecting rods I make. They are virtually perfect, but could end up being priced 2-3 times more than the "cheap" rods therefore virtually nobody would buy them! I was told by an engine builder that on an inline motor that the rods only have to be balanced to total weight. The pistons are all going up and down so the end weights don't matter, Don. Who ever you talked to Don, and told you that, isn't even close to an engine builder! To balance a T engine the #1 and #2 rods and pistons would need to be the same weight and the #3 and #4 would need to be the same. The weight of the 1&2 set could be different then the 3&4 set with out throwing the engine out of balance. It is kind of like two independent 2 cylinder motors. Just because one weighs more does not mean it is out of balance. To get a set of rods with the oil grooves the way you want them, or without, and perfect balance order them from Ron's Machine in Ohio. Rods being the same weight means nothing if the rods are not a balanced weight of being the same weight. If the rods are not balanced, being the same weight means nothing. You also do not put two sets of rods, or pistons in the same engine of a different weight mass in the same engine, as that will give an uneven load to either end of the crank. That would be like using two Aluminum pistons in the front 1&2, and a set of cast pistons in 3&4! Two grams in the same like rods, but not rods of any more then that as in heavy and lighter rods mixed. I'm going to try explaining this with an analogy. Think of a modern tire balancing machine. I'm sure many of us have balanced tires or seen the guy at the tire shop do it. The tire gets spun and when the machine stops it tells the mechanic where to add weights. Usually they have to put some weight at a specific point on the outside of the rim and usually also have to put some weight at a specific DIFFERENT point on the back of the rim. Sometimes you see circumstances where a 3/4 ounce weight gets placed on both the outer and inner surfaces of the rim but 180 degrees apart. The reason for this is because the mounted tire is heavy on both the outside and inside surfaces but 180 degrees opposite of each other. Now, if you took that same tire (without the weights on it) and put it on an old fashioned "bubble balancer" or a "mandrel & knife edges" and checked it, you would find that it did not require balancing. (while it actually does have a moderate balance issue that a more sophisticated form of equipment can easily diagnose and remedy). Without the right method of balancing, you would not know it was out of balance, but when installed on the car, you would likely notice a vibration at certain road speeds... SOUND FAMILIAR? Crank shafts in particular can be heavy on just one side, but more often can be both heavy at a point in the front AND at a fairly opposite point in the rear. Connecting rods that are not equalized for rotational and reciprocating weights as well as pistons that don't weigh the same can add up and multiply these dynamic forces. Anything out of balance does two major things; Consumes additional power that otherwise would be applied to the rear wheels and reduces longevity. Anything out of balance also has a third characteristic that comes into play when adding ANY item meant to enhance performance; When the power of the engine is increased by any percentage, so is any imbalance that is already present, and while power may seem to improve, you are usually paying for that additional power in significantly decreased longevity. Might want to check the rods one buys from a rod shop. I bought a set and they were not even all Ford rods and the weight varied nearly 79 grams from lightest to heaviest. Oh yeah, and then the babbitt fell out. It is wise to double check anyway. And, Doug, that is just about everywhere! I have a question from Aaron. Just out of curiosity, why do you say the rods from Ron's Machine are in perfect balance? Is it because they said they are, or did you check them? Are they the "regular" rods they usually sell, or something special? I have Check many rods from Herb Kohnke and they are perfect including weight.